Yellow is such a fun, happy color. It embodies sunshine and happiness. So why then do I so seldomly wear it? Part of the reason is that I am blonde, and blondes notoriously look horrible in most shades of yellow. It washes out our skin tone and certainly does little for our hair color. But this season's yellows are bright and vibrant, shades of yellow that actually flatter blondes. I've been making an effort to add a few yellow pieces to my wardrobe to mix things up a bit and put those dark, gloomy colors of winter behind me. In today's installment of Friday Fresh Picks I'm sharing a few of my favorite yellow items...to wear and to decorate with. 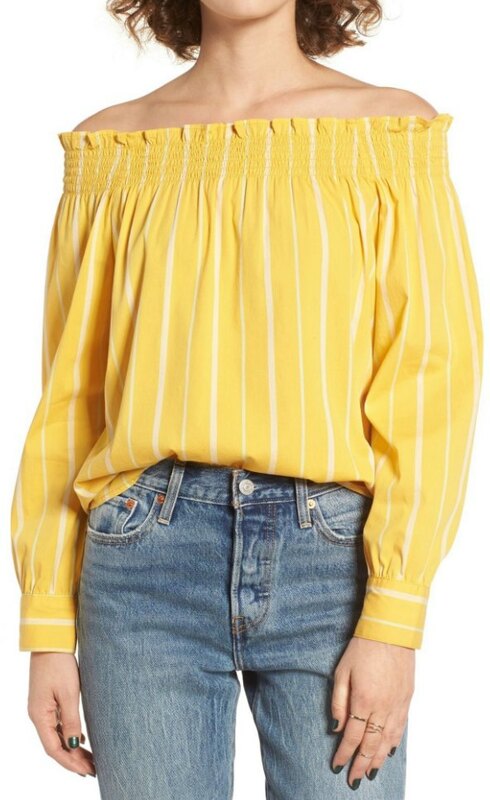 I've added several off-the-shoulder tops to my closet this spring, but I have yet to add a yellow one. This one is super cute, and you cannot beat the price. It's on sale for $27!! Buy it here. If yellow isn't your color, try wearing it in accessory form. This pendant necklace would pair well with any color (except yellow, of course). These tassel pendant necklaces are very on trend right now. 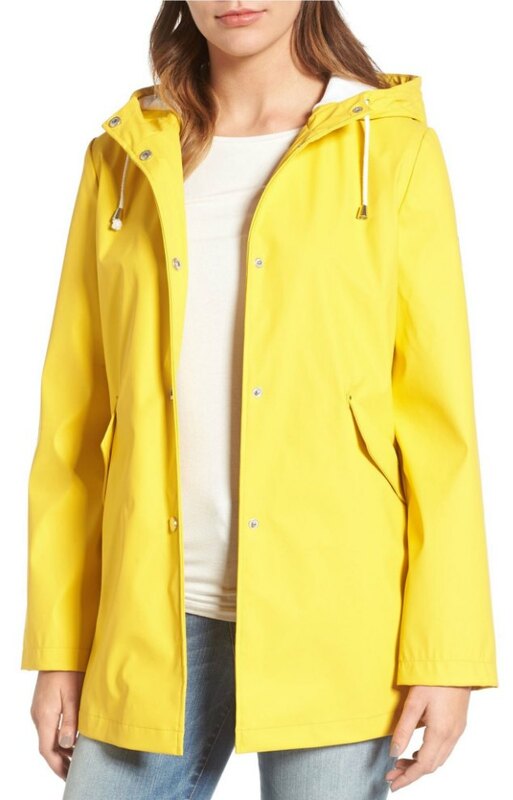 Be prepared for the rainy season with this classic and adorable yellow slicker. It reminds me of the slickers I loved wearing on rainy days as a child. I love to throw on a soft, comfy tee for easy summer afternoons. 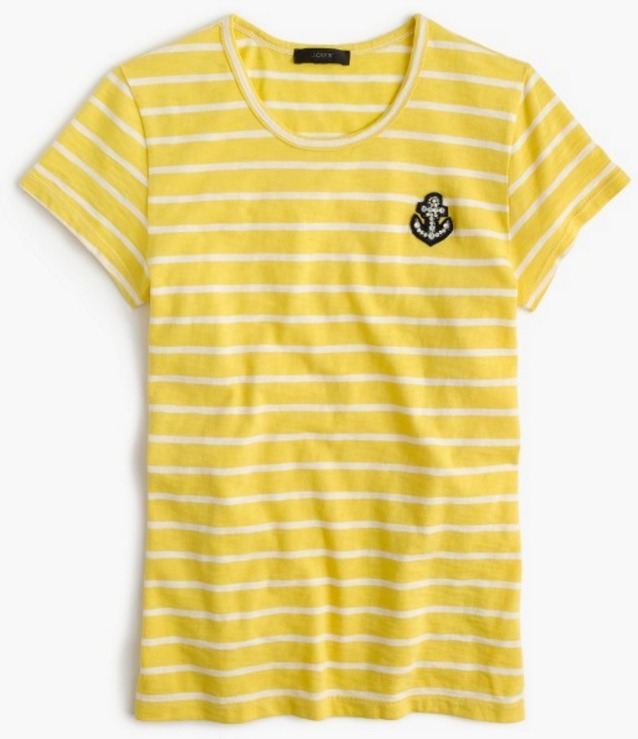 This striped tee has an anchor patch as an added bonus. This ruffle, one shoulder dress is everything. Everything! I mean, look how cute it is. 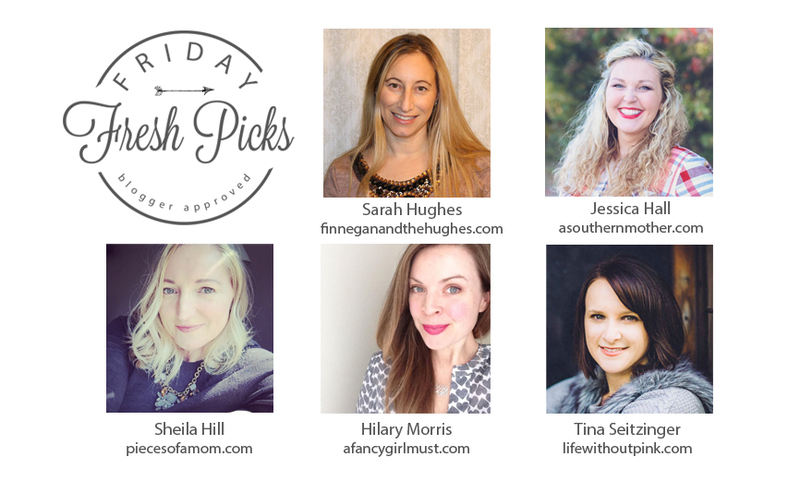 Dress it up with a strappy sandal or dress it down with a pair of plain white sneakers. 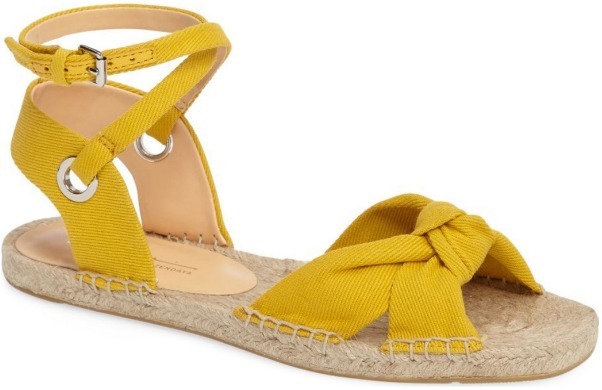 Speaking of strappy sandals, this ankle strap espadrille-style sandal is perfect for casual summer outings. All eyes will be on you in this vibrant v-neck bathing suit. 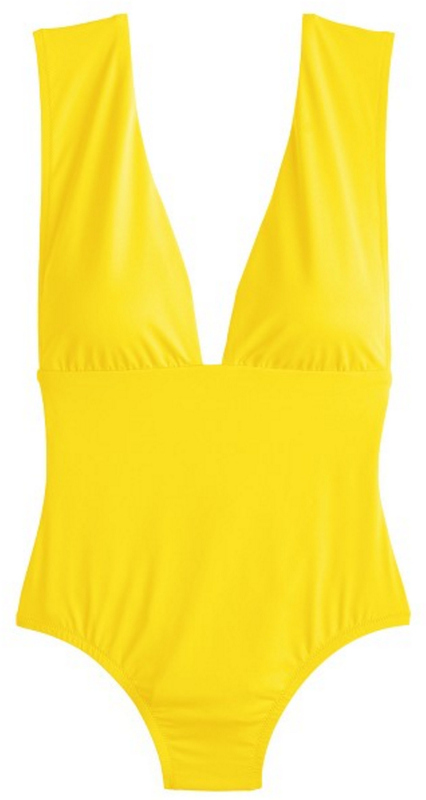 I just bought this bathing suit in navy, but I'm kicking myself for not purchasing the yellow. It's stunning and would look great with sun-kissed skin. OK, so maybe wearing yellow isn't quite what you had in mind. If you can't wear it, decorate with it! 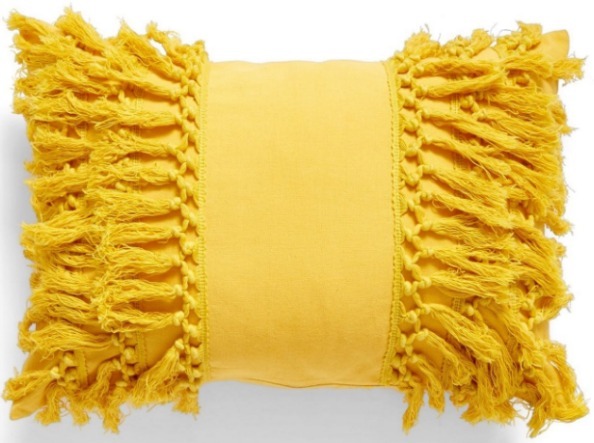 This fringe throw pillow placed strategically on a sofa or on a few chairs is sure to be a conversation piece. I do a lot of baking, and I have long been in search of a mixing bowl with a spout for easy pouring into baking dishes and pans. Found it! 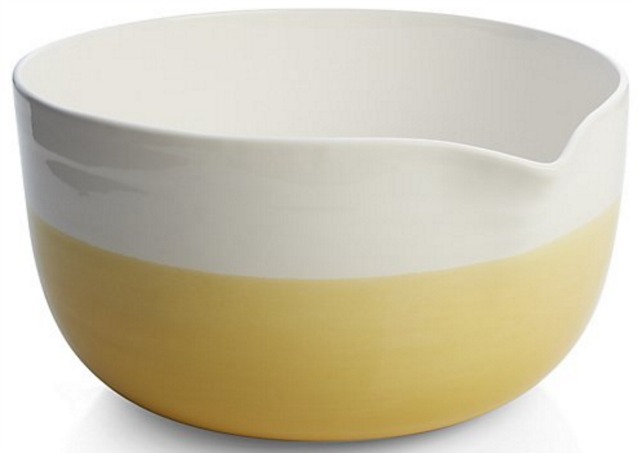 The yellow and white colorblock mixing bowl is the cutest addition to my kitchen.